As some of you may know, although I love the arts, I have never been that big of an "art" fan (in terms of paintings, sculptures, etc). I hated art class, and art teachers were never very thrilled by me either. But a piece of today's news piqued my interest - Andrew Wyeth died today. Of course, until today, I didn't know who Andrew Wyeth was. So why did the news catch my eye? 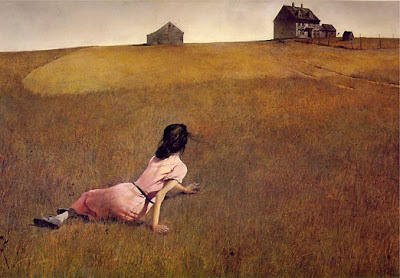 This was the headline: "Andrew Wyeth, 'Christina's World' painter, dies." Apparently, Christina was Wyeth's neighbor. She was a strong, independent woman who suffered from polio. And this was her world. That is so moving to me. Of course, I just read that this is a famous painting and I apparently live under a rock. But paintings like this make me regret not being more interested in art. Maybe a trip to the museum is due.